I will be teaching at Swansea Festival of Stitch on August 10 2018. It is an unfortunate clash with Festival of Quilts, but the programme looks great. I have called my class ‘Beautiful Surfaces’ as that is something I have been working on for a while. When I say ‘that’, it is a theme inspired by a quote from a letter that Nietzsche wrote in a letter to a friend. He said that, (roughly translated) “without terrible depth, there are no beautiful surfaces”. Now, I have my own deep and meaningful exploration of the phrase going on, but as far as surface design goes, I am keen to create a complex, ‘deep’ surface on cloth, before I begin piecing or stitching. Experience has shown me that there is a flexible order to the processes I use and I am hoping to save the students a bit of time in avoiding the mistakes I learnt through my gungho experimentation. It will be a packed day, but with good preparation the students will dye, discharge, stencil, foil and mark-make. Other work – I am still stitching into ‘My Mother’s Chair’ – a deeply personal piece, that due to the use of her old household textiles, has a life of its own. I am stitching with my mother’s collection of hosiery thread – a limited palette of nylon, wool and cotton. The number of skeins defies understanding! As the top fabric, an old tea stained tablecloth, slides and moves and billows and stiffens like a wild thing, it will never be quilt-perfect, but it will speak its narrative. When blogging first began, I was a great blogger and built some great connections, posted regularly and added thoughtful content. Then came big-life – births, deaths, weddings, funerals, Instagram, Facebook, Twitter, and more life! What have I been doing lately, (trying to cover everything between posts is impossible)? Well, after a long wet, cold, winter hiatus, we are back on the new studio build. It will be a good space, with a lovely view, in time! At the moment we are still having regular debates about roofing, windows, etc. We are organic self builders, rather than detailed planners. That method has worked for us over the years as ideas emerge and existential knowledge alters them. For example, only through pondering over time, did we decide to lower the ground, (hence the pile of boulders – our house is built on rock not sand!) and that was a great decision – the studio nestles in the space rather than looming alongside our little cottage. Rest assured, we do pay scrupulous attention to building safety and strength! Here is my previous space – Strawberry Studio, (named after the designers of my favourite skirt from the 70s). It is a wonky place built over 20 years ago – my first attempt at building ‘a room of one’s own’, (the DH had to help – a lot!). The old little studio was recommissioned as the wedding kitchen, but that was two years ago and I have since worked in a bedroom. I am not moaning – many great artists have no workspace, let alone a spare bedroom. I am excited and feeling privileged in equal measure. My main hope with this dedicated space are, apart from available work surface, to free up household cupboards and floors, and to be able to find what I want when I want it!! Oh, and to make great art! Still setting fair the workroom. “Setting fair” – used to love the end of the day when I worked with horses and everyone was mucked out or turned out, the tack was clean and, last of all, the yard was swept. My current studio activity is the textile equivalent of mucking out, in the hope of being able to set fair for a very busy winter of high-brow art! Before that, some work that is more craft than art. I have had a white knitted felt bag base knocking around for several years. Adding a few hand-dyed fabric scraps and beads, means it is now a finished item. In the spirit of the autumn feeling I always get, and it feeling like autumn already, I am in a use it up, tidy it up, sort it out, throw it out mood. I have had a clamshell purse frame for ages and ages. I used it with some hand-dyed velvet which I embroidered with some cotton from Paint Box Threads – a Festival purchase. I loved the process – much easier than I expected. For a first try it is good, but not, of course, perfect. I learnt that using cotton velvet makes life difficult and you can see – as I point out the flaws!! – that the thickness of the fabric make neat corners nigh on impossible. A lightweight Panne velvet would have been a dream and any silk, wool, or cotton without bulk would do well. Just needs a polish to clear up any glue strand on the metal and I am good for any soirée you care to invite me to! 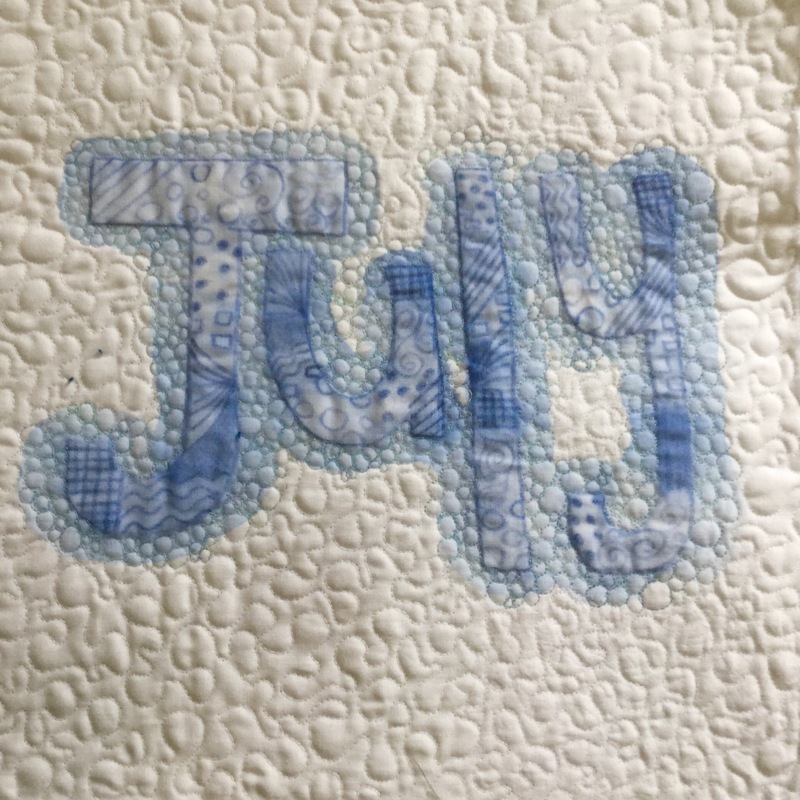 A freezer paper stencil and blue oil stick, close meander stitched in variegated blue thread around the letters and open meander stitching to fill. Simple but I like it. 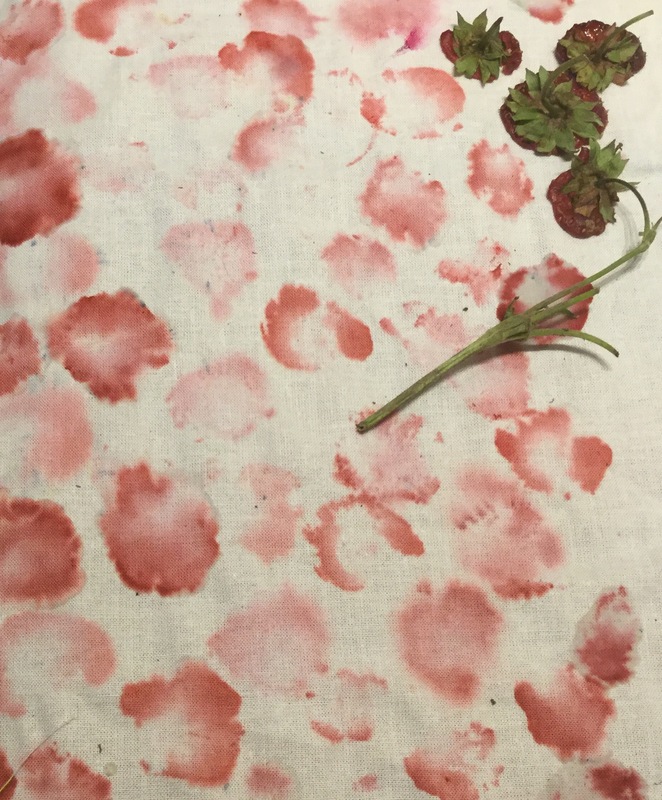 Strawberries make mighty fine prints. This may well fade to browns, but I love transitions, so that’s okay! Just using the trimmed tops – we ate the berries! Here is July’s CQ 11″ X 11″ Journal quilt. The year’s theme is ‘Text’. This quarter the techniques all use applied colour, (as opposed to dyed colour). Here I have drawn onto the cloth with Inktense pencils, then sprayed with water. This does cause colour-bleed, but I like it. Bubble-stitching with blue and then white thread, emphasises the blurring. To focus on the lettering I have adjusted the scale of the quilting. Last 11″ X 11″ CQ Journal quilt of the second quarter. Year’s theme ‘Text’, quarter’s method – stitch. 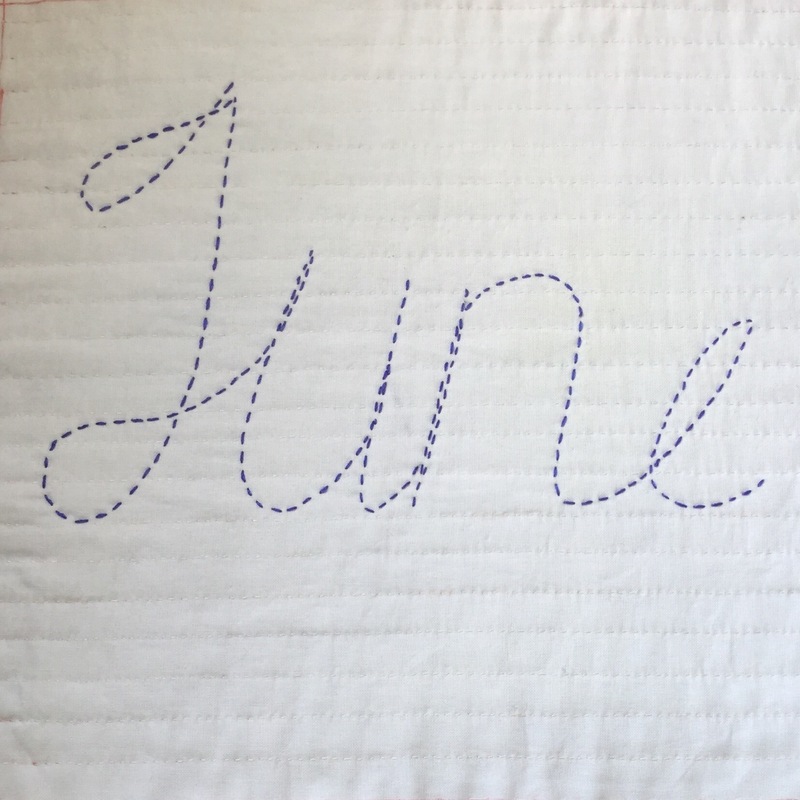 June is hand stitched in threads which contrast the text and background.